Many startups die trying to find early traction. Here’s how we survived. When we hit our original goal of $100,000 in monthly revenue, I mentioned that there were plenty of lessons from the early days that still hadn’t been told. As we draw closer and closer to our 3,000th paying customer, I get more and more questions about our first users. Specifically, about how we signed up our earliest paying customers; a huge challenge — and monumental milestone — for any startup. It’s important to note that these aren’t tactics to get paying customers today. None of them worked instantly for us. Much like the team at Unbounce, we started working on building our customer base long before we had an actual product. 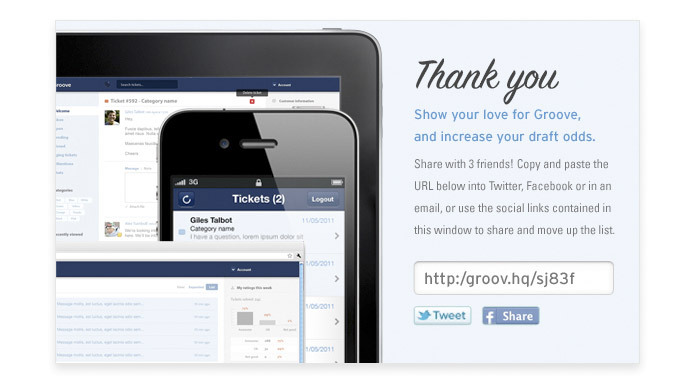 And even after we launched, we offered Groove for free to everyone, so our very first users didn’t pay a dime. It wasn’t until several months later when we finally turned on paid accounts that we got any paying customers. But by then, we had more than 1,000 free users, and more than 100 of them converted to paying customers on the first day. 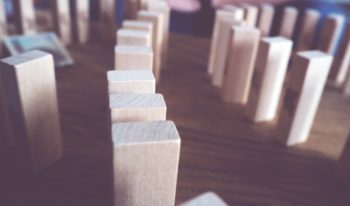 It’s not easy, and there’s no silver bullet, but below are the tactics we used to lay the groundwork that let us get more than 100 paying customers in a single day. We’ve made no secret of the fact that we worship customer development at Groove. Getting — and staying — close to our customers has been the lifeblood of our business. That obsession started long before we had a product. When we were building our first sketches and Groove’s early prototype, back I was the only non-technical person on the team, nearly all of my time was spent on customer development. 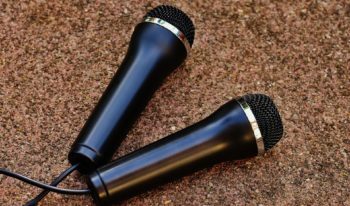 In the early days of Groove, my network wasn’t particularly impressive, but I had gotten to know a handful of small business owners during my time building my last company. These were the first people I reached out to. I wanted to validate that others had the same pain that I felt with customer service software. I sent emails to those that I knew had to deal with support for their businesses, and I asked if they’d be willing to talk to me about their experiences. I was surprised at how willing most folks were to help. How is your team handling support right now? Have you tried anything else that didn’t work? Why didn’t it work? Note how none of these questions pitched Groove. In early customer development, you’re not selling. You’re learning. I’d let the person know that I was hoping to have a product launched in a couple of months, and ask if I might be able to reach out to them once it was live to get their feedback. Almost all of them said yes. Many people did give me referrals, and this created a powerful multiplier effect as we built our early prospect list. I wanted to talk to people who used our competition’s software so that I could learn how to make our own product better. So every time I was getting online support from a company — whether I was troubleshooting software or returning a pair of shoes — and I noticed that they were using Zendesk, I’d ask them about their experience. Again, many people were more than willing to chat, and this led to a lot of great insight that helped us improve our positioning and messaging early on. Note: you can approach a moral grey area very quickly with this tactic. I do not recommend using this to poach customers from your competitors; it’s sleazy and will probably get you low-quality customers. On the other hand, I absolutely recommend having conversations with your competitors’ customers about their experience, especially if they’re avid fans of the product. You’ll learn a lot. Another way I got to chat with people who used competing software is by using Twitter search. I’d look for people complaining about other support products, and ask them if they’d be willing to chat. This helped us steer clear of building a lot of the existing pains people had into Groove. As my existing network wasn’t that big, I worked hard to build relationships with people who could one day get value from Groove. While there isn’t a whole lot of meetup activity here in Newport, I’m not far from Providence, where the scene is vibrant and events are frequent. Early on, I’d go to a lot of these events to meet other small business owners. I’d help them however I could (with introductions, advice, etc. ), and many of them were happy to participate in the same customer development circuit that I put my own network through. 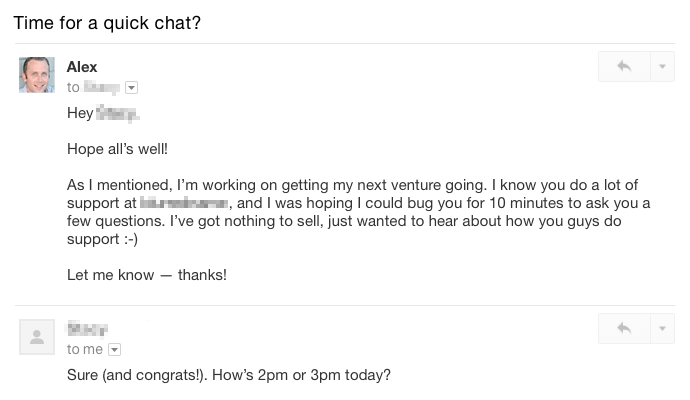 A few weeks ago I wrote that getting rejected from YC doesn’t matter. And I believe it deeply. But incubators are a great source for networking, even if you aren’t a member. At first, I did things the wrong way: approaching incubator leaders and asking for access to pitch their startups. Not surprisingly, all refused. When that failed, I tried to build relationships with two or three startups in every local incubator, and then asked for introductions to their classmates. Many of these startups ended up becoming some of our most active early users. Turning early leads into users: Most — an overwhelming majority, in fact — of the early people I spoke with did not end up trying Groove. But some did. And that’s why it was so important to put in the time to reach as many people as I could, so that even with a single-digit conversion rate, we could get enough early users to start growing our business. Don’t take it personally when people don’t end up using your product. Switching is hard, and you’re asking for a lot. Early on, our new users skewed heavily toward teams coming from simply using a shared Gmail inbox, rather than those using Zendesk or Desk, because the switching costs were low enough to take a risk on an unknown product. Now, the ratio looks quite different. Once our beta version was ready for testing, we began to work on getting the word out about our new product. 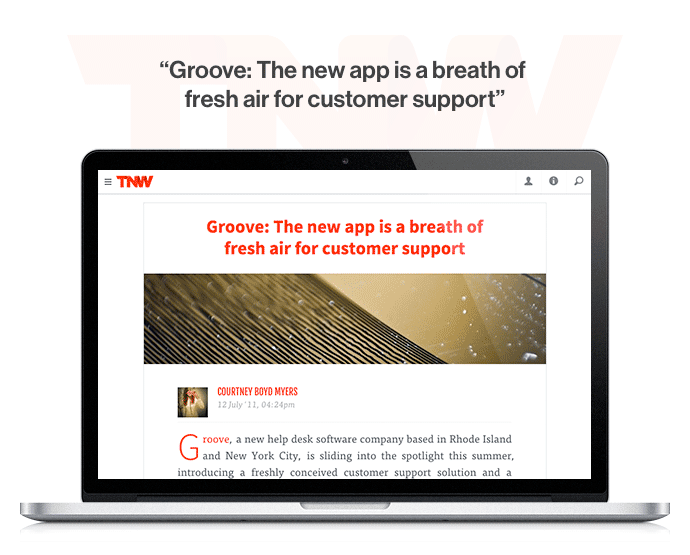 A week later, we had around 1,000 beta signups, many of them driven from TNW. Our early blogging efforts look* *nothing like our blog does today. It was a lot of stumbling and trying to figure things out. 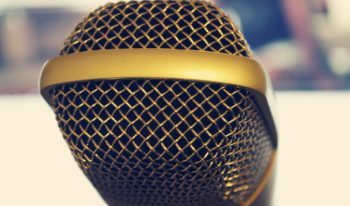 The first post we had that did well would eventually become the post that inspired this Journey to $500K blog that you’re reading now. It was about how we got 1,000+ private beta signups. Honestly, it’s a bit embarrassing to read. 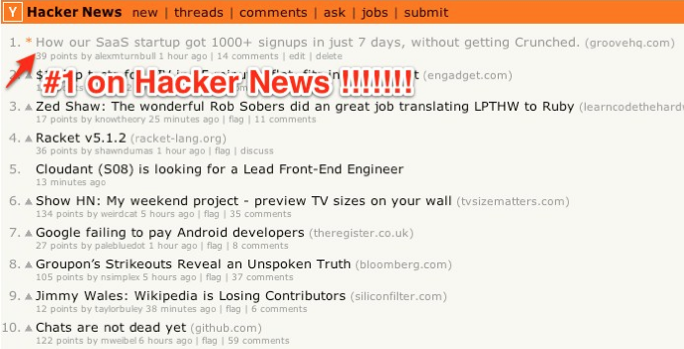 The post would never see the light of day on the blog today, but we took an important first step in realizing the power of content marketing when the post got picked up on Hacker News, and even reached the top spot for nearly half of a day. The Hacker News traffic brought more free signups, many of them much closer to our ideal customer persona than the average TNW reader. Like many software companies, we kept our beta limited so that we wouldn’t bite off more than we could chew. So through all of our outreach efforts, we sent visitors to a beta signup form that would put them on a waiting list, and then offer them a chance to advance by sharing the form. This increased our free beta signups at the time by nearly 30%. 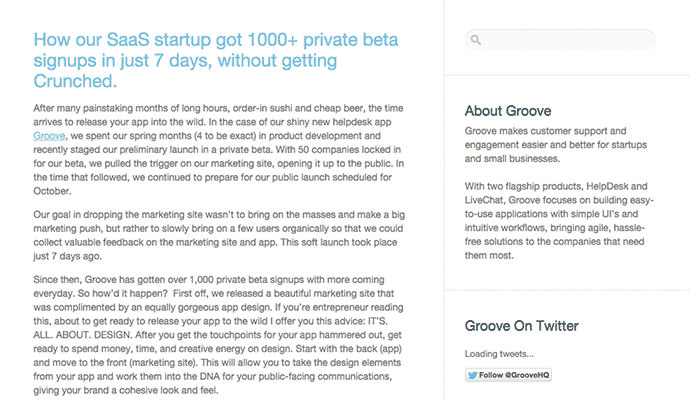 By the time we were ready to turn on paid accounts, we had more than 2,000 people sign up for free Groove accounts. On the day we made the switch, more than 100 of our free users chose to sign up. And while our product has gone through massive overhauls and improvements since those early days, that first group of customers formed the core of our feedback loop that helped us turn Groove into what it is today. Some of this stuff might seem silly because of how elementary it is. But that’s the point: nothing that we did to get our first paying customers was magical or impossible. It was simply hard. It took a lot of legwork. More than I had ever done before. And it’ll likely be the same for you. But you don’t even have to have a product ready to get started. In fact, if you can, I’d start well before you launch. No matter what stage you’re in, I hope this post has given you some ideas to get out there and get the traction you need to start growing.